Photo courtesy Two Roads Brewing Co.
There’s not much to look at while driving through Connecticut on Interstate 95. It’s harbor cities with industrial skylines for the most part, with billboards providing the most visual entertainment between New York and Boston. You quickly get a sense of just how many McDonald’s there are conveniently located just off the next exit. Or if local fare is your speed, count the advertisements for a chain known as the U.S.S. Chowder Pot. There’s a bevy of billboards advertising strip clubs and adult novelty shops. So, the billboard at exit 31 in Stratford stands out, not only for its lack of depicted food or scantily clad women, but also because it’s advertising a brewery. Turn here, it beckons. Fresh beer, it says. 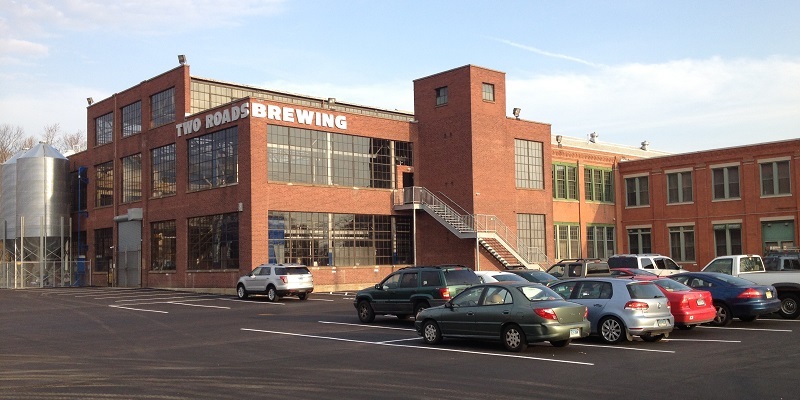 Like an oasis, Two Roads Brewing Co. appears. The city-block-sized industrial building that once manufactured helicopter parts has been meticulously refurbished and fitted with a 100-barrel system and state-of-the-art bottling, canning and keg lines. On the second floor, a bar overlooks all this and locals are downing house-made pints of Ol’Factory Pilsner, Rye 95 or Lil’ Heaven session IPA. But look closely on certain days and you won’t see Two Roads-branded beer running off the line. Instead you could see Blue Point Brewing Co. beers, an IPA from Lawson’s Finest Liquids or ales for other breweries that are several states away. As the U.S. beer market continues its bottle-rocket climb, brewers are looking to expand. Often because of space constraints, for financial reasons, a desire to access better equipment, or because they simply lack a facility of their own, these smaller companies are turning to the time-tested practice of contracting with larger outfits. The idea of one company brewing and packaging beer for another is nothing new. Simply put, contract brewing is when an existing brewery—usually very large—rents out its equipment, from brew house to bright tanks, to another brewery, with the goal being increased production. In some cases the smaller brewery works closely with the contract operation, overseeing every step, including recipe development and the actual brewing. In other cases, it’s a simple matter of writing a check and having the contract brewer handle every step from recipe creation to brewing, packaging and shipping. It’s that second point that has fostered the impression by some that contract is a dirty word. That the breweries contracting out don’t “have skin in the game” or are in the industry for profit, not passion. Jimmy Carbone, owner of Jimmy’s No. 43, a popular beer bar and restaurant in New York City’s East Village, for years kept contract beers off his draft lines. In recent years, however, as breweries like Stillwater Artisanal, Evil Twin Brewing, and Pretty Things Beer and Ale Project continue to release sought-after, inventive and quality beers without a “home” of their own, perceptions are changing. In the United States, it’s been happening for decades with many of the mainstream popular brands getting their start forgoing brick and mortar facilities and using existing large-scale equipment. The Boston Beer Co., makers of Samuel Adams, may be the best modern example of this practice, as larger, established brewers across the country took on production of Boston Lager when the brewery was founded in 1984. 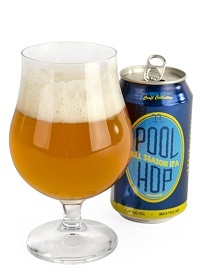 Today, U.S. production is done in-house by the two large Boston Beer breweries in Ohio and Pennsylvania, as well as its smaller facility in Massachusetts. Pabst Blue Ribbon is another example of large-scale contracting, but in a different way. By the mid-1980s, when the once-mighty Pabst closed the last of its breweries, it moved production to a number of remaining companies, including Miller Brewing Co. Where others saw contract brewing as a way of growing, Pabst saw it as the way to stay in business. Now under new ownership, Pabst will continue to produce much of its volume with contract partners, but is planning on building smaller breweries in cities like Milwaukee and Newark that it once called home. RELATED: Pull Up A Stool With Eugene Kashper of Pabst Brewing Co. In the last few years, however, the contract model has become attractive to newer breweries. With more than 3,600 breweries operating in the U.S., many new ones start off without their own facilities, but hope to gain enough business to eventually do so. For decades, breweries like the City Brewing Co. (with locations in La Crosse, Wisconsin, Memphis, Tennessee, and Latrobe, Pennsylvania), the F.X. Matt Brewery in Utica, New York, and more played host to breweries and brands. In the last few years, a new generation of contract brewers, including Two Roads, Brew Hub and Brew Detroit, have entered the marketplace and are not only creating their own beers, but also helping other brewers produce additional barrelage to meet consumer demand. This is an era of smaller breweries. The majority of breweries currently opening are in small spaces, with systems that range from nano to maybe 30 barrels. For the seasoned brewery traveler, walking into Two Roads can be a bit of culture shock: a 100-barrel brewhouse and enough space to eventually let the brewery reach 250,000 barrels in annual production. Having a good team in place has also helped Two Roads change the perception of what modern contract brewing can be. Along with Pellani, the founding partners are Peter Doering; Brad Hittle, the chief marketing officer at Pabst until 2010; and Phil Markowski, an award-winning brewer known for his farmhouse ale recipes and his time at the helm of the Southampton Publick House in New York. Pellani says the brewery’s taproom (which only serves Two Roads beer) is really the most important part of the concept. Here locals can gather in the second-floor bar alongside the weary highway travelers, enjoying a pint and looking out into the cavernous brewhouse. It’s not uncommon to see well-known brewers—unwinding after a contract shift—talking over a pint. While the majority of brewers contracting at Two Roads completely acknowledge the fact, even putting it on their packaging, other breweries would rather not advertise that some of their beers are made outside of their brewery. 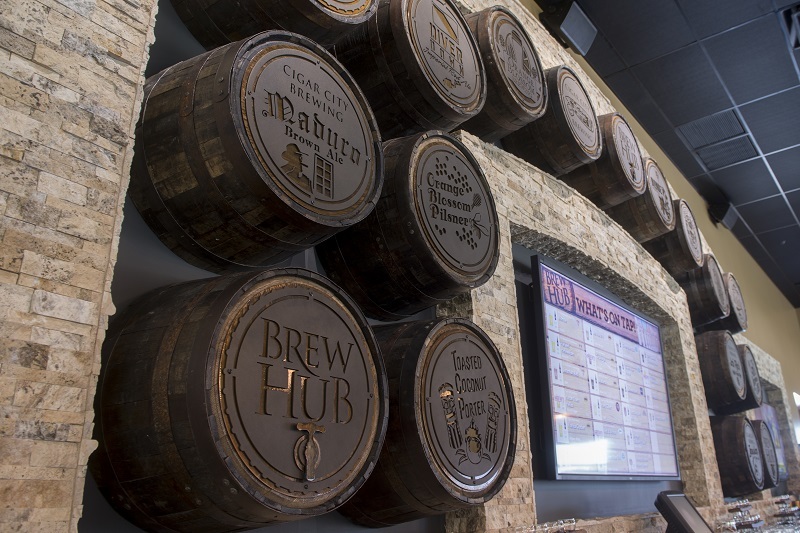 Brew Hub, a large gleaming facility, in Lakeland, Florida, with adjoining taproom and generous outdoor space, proudly advertises the brands made inside. In addition to house-made beers under the Brew Hub label, the logos for Green Man Brewery in Asheville, North Carolina, and Cigar City Brewing Co. in Tampa are visible to passersby on Interstate 4. Timothy Schoen, the CEO of Brew Hub, chafes at the word “contract.” A few months after opening the company’s facility in Lakeland, a 40-minute drive east of Tampa, he was on the phone urging the use of another word. 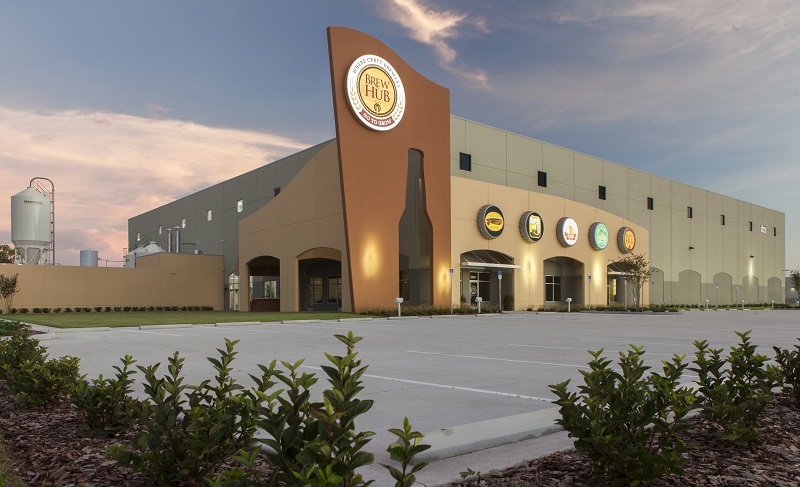 We spoke three months after Brew Hub had opened the Florida location and shortly before the company announced that a second facility, modeled in the same fashion, would open in St. Louis next summer. Other locations are being scouted. “We’ve seen a lot of exploration and innovation, and there’s already been collaboration,” says Schoen, a former vice president at Anheuser-Busch. The company recently hired James Ottolini, known as Otto, the former head brewer at The Saint Louis Brewery, makers of the Schlafly line of beers. As chief of brewing operations, he is responsible for innovation, technology and quality control. Whereas many of the contract facilities of the past were built to really just produce lagers—understandable given the country’s beer-drinking history after Prohibition—Ottolini sees this new model, and his role, as bigger than one style or path. “There is no such thing as a reward without the risk,” he says in a phone conversation. “Who knows what’s going to happen with the beer market, and people changing. I look at the market and say, ‘What’s today’s beer drinker like? What styles do they like?’ and way gone are the days of people loyal and faithful to one beer.” Ottolini says Brew Hub has its finger on the pulse, and that’s what will keep it current and forward-thinking. While some of the newer generation of contract breweries are helping out-of-state breweries expand, in the economically distressed city of Detroit, a new brewery named Brew Detroit is keeping a focus on local. Its main customer is Atwater Brewery, a local company that needed additional space to meet growing demand. Mark Rieth is the owner of Atwater and a partner in Brew Detroit, which has a 100-barrel brew house and plenty of 200- and 400-barrel fermenters. It can currently handle 60,000 barrels, with room to grow. The other notable customer is Badass American Lager, a beer promoted by musician Kid Rock, a Michigan native. Along with Rieth, Brew Detroit is owned by Don Foss, David Crawford and Keith Sirois, the CEO of Big Boy Restaurants International. Rieth says that the majority of bottling and all of Atwater’s canning come out of Brew Detroit, with recipes focusing on the core lineup. The original brewery is now used for kegging, seasonals and specialty one-offs. Thanks to its size and packaging facility, Rieth says, Brew Detroit is regularly fielding calls from breweries around the country looking to get into the Midwest market. As more breweries enter the fray, and as international brewers look to increase footprints in the United States, it’s a good bet that contract brewing will continue to grow. And where it might have been a concept that turned off some beer drinkers in the past, more and more the liquid is speaking for itself, and customers are focused on flavor and the people behind the recipes rather than the equipment or where it’s made. “Ultimately the consumer will win because the beer is going to be fresher, at quality, or higher quality and available,” says Brew Hub’s Schoen. The following beers were tasted by Ken Weaver. Tasting Notes: While this doesn’t have the aromatic impact of many of the session IPAs crossing the All About Beer Magazine tasting panels as of late, there’s a lot to say for it otherwise. Persistent bubbles and a crisp mineral edge frame things, with the overall profile showing like a cross between blond ales and session IPA. Plenty of floral and subtle hop aspects (light on the citrus) and just about perfectly built for some languid poolside sipping. 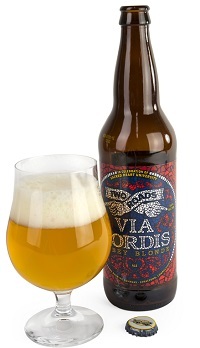 Tasting Notes: Two Roads’ “Abbey Single” is brewed in collaboration with biology faculty at Sacred Heart University. This is a peppery, convincing take on the category, with core white pepper and clove rounded out by vanilla esters and almond near the edges. Mellow monastery drinking, for sure—but with a persistent edge of yeast- and hop-derived bitterness keeping things on course. Well-appointed for being close to 5%. In.my opinion this’s a great strategy and business to new and small beer company. i just wanted information on someplace who would brew small batches of beer.